"The guarantee of land-line telephone service at almost any address, a legal right many Americans may not even know they have, is quietly being legislated away in our U.S. state capitals," David Johnston of Reuters writes. He says AT&T and Verizon, the dominant phone companies in the U.S., want to end "their 99-year-old universal service obligation," claiming universal land-line service is costly and no longer justified. Johnston says new rules the companies drafted would allow profit increases by letting them only serve the customers they want: "well-populated areas where people can afford profitable packages that combine telephone, Internet and cable television." Florida, North Carolina, Texas and Wisconsin have gotten rid of universal service obligations. The Republican-controlled Kentucky Senate passed repeal legislation this session, but it died in the Democratic-controlled House. Johnston writes that state legislatures have been enduring "intense" lobbying to end universal service, but the public hasn't been made aware of it because of "dwindling ranks of statehouse reporters." Many natural gas gathering pipelines aren't inspected for damage, according to a U.S. Government Accountability Office audit released last week, and Jim Malewitz of Stateline reports pipeline transport can still be dangerous because of corrosion, leaks and ruptures that need to be inspected. Most unregulated lines run through Alaska, California, Louisiana and Oklahoma. Inspection is left to operators who aren't required by law to do so. UPDATE: Gov. Steve Beshear signed the bill into law, Roger Alford of the The Associated Pressreports. "I think we were able to fashion a solution that helped folks with their religious issues but at the same time still maintained the standard of safety that we have to have on our highways," Beshear said. "A bill to provide an alternative for Amish buggy drivers who object to using bright safety triangles on their vehicles was approved Tuesday by the Kentucky House and is headed to Gov. Steve Beshear," Gregory Hall and Joseph Gerth report for The Courier-Journal. The bill would allow them to use one-inch silver reflective tape instead of the standard orange reflective triangle for slow-moving vehicles. Several Amish men in Western Kentucky have been jailed for refusing to pay fines for traffic citations not using the triangles. Their sect's beliefs don't allow them to use bright colors to draw attention to themselves and the men claimed the requirement infringed upon their religious freedom. They've appealed their convictions to the Kentucky Supreme Court, but if Beshear signs the legislation, it would go into effect immediately and make the case moot, Hall and Gerth report. A new study released yesterday concludes that conservatives' trust in science has declined "precipitously" since 1974, reports John Hoeffel of the Los Angeles Times. Confidence in science declined most among better-educated conservatives, a "surprising finding," author Gordon Gauchat said. A 2012 Gallup survey found that only 30 percent of conservatives believe greenhouse gases contribute to global warming. Two years ago, 50 percent believed that. Gauchat said the sharp decline among educated conservatives is due to their extensive knowledge of conservative ideology, which leads to stronger "ideological dispositions" than less educated people. Also adding to the decline is the increased visibility of the conservative movement, Gauchat said. The movement has expanded "substantially in power and influence, particularly during the presidencies of Ronald Reagan and George W. Bush, creating an extensive apparatus of think tanks and media outlets." Using General Social Survey data, the study found two demographics with "a significant erosion of trust in science: conservatives and frequent churchgoers," Alan Boyle notes on msnbc's Cosmic Log. "Why the drop? Gauchat suggested that the character of the conservative movement has changed over the past three and a half decades — and so has the character of the scientific establishment." The owner of The Anchor Weekly in Chestermere, Alberta, has resigned as editor after several accusations of plagiarism, reports Daniel MacEachern of The Telegram of St. John's, Newfoundland. Steve Jeffrey was accused by American humor writer George Waters of plagiarizing more than 40 columns in the past year from 14 different writers. Waters told Andrew Beaujon of The Poynter Institute that he read all of Jeffrey's 52 weekly columns from 2011 and found 42 of them were stolen from other writers, the most frequent of which was Tennessee humorist Sheila Moss. Jeffrey sent an email to the Calgary Herald which said: "I really don’t have any way to defend myself. I did use articles for inspiration, but thought that I had changed the content enough to comply." He did not respond to MacEachern's requests for comment. Since he owns the Anchor, it's unclear what his resignation means for the paper. 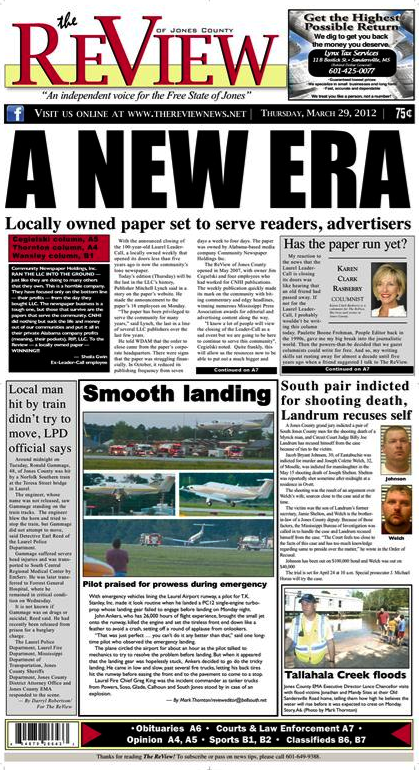 UPDATES: Mississippi-based Emmerich Newspapers "decided to launch a thrice-weekly publication and hired all the former Leader-Call staff to operate it. To be called The Chronicle, the first publication date of the start-up is reportedly April 15," Arkansas Press Association Executive Director Tom Larimer reported in the Arkansas Publisher Weekly. (Read more) However, the Review bought the Leader-Call's name and subscriber list and revived the paper as a thrice-weekly on April 19. For the paper's account of that, click here. The Review of Jones County, Mississippi, a weekly newspaper, has loved to tweak its daily competitor, the Laurel Leader-Call, for being owned by a chain and making mistakes. This week it trumpeted victory, as the Leader-Call published its last edition. 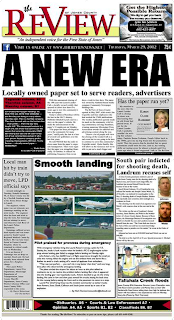 The closed paper's stories about its demise were no longer available online, but a short story on the news service of its owner, Community Newspaper Holdings Inc., said "Publisher Mitchell D. Lynch advised the paper’s 18 employees of the decision Monday afternoon. He said subscribers who had paid for the paper in advance would be reimbursed." The paper cut its frequency to four days a week from seven about six months ago. It was 100 years, seven months and 18 days old, starting as the Laurel Daily Argus, which changed its name to the Laurel Daily Leader. It became the Leader-Call in 1930. CNHI bought it in 1999. The Review of Jones County was established in 2007. For its site, click here. Laurel is about 30 miles northeast of Hattiesburg, on Interstate 59. Researchers at the U.S. Geological Survey have concluded that a big increase in earthquakes in mid-America in the last decade "appears to be related to oil and gas drilling," reports Mike Soraghan of Energy & Environment News. 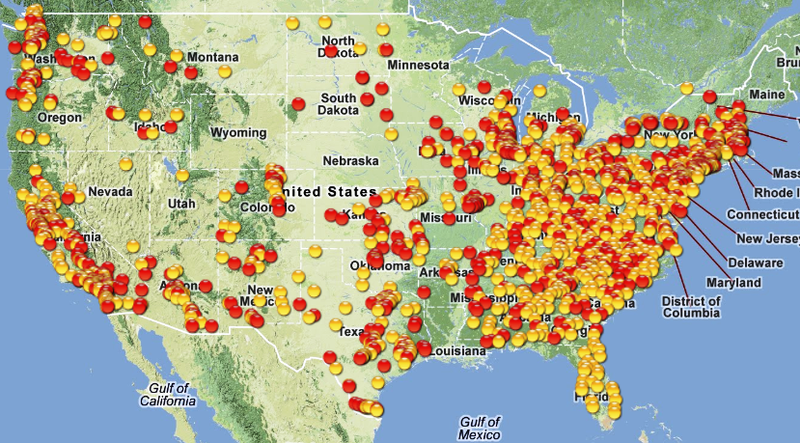 While the quakes are generally small, the study looked at all U.S. quakes of magnitude 3 and greater since 2001. "A remarkable increase in the rate of M 3 and greater earthquakes is currently in progress in the U.S. midcontinent," the scientists write in the short description of their study. "A naturally-occurring rate change of this magnitude is unprecedented outside of volcanic settings or in the absence of a main shock." While the changes "are almost certainly man-made, it remains to be determined how they are related to either changes in extraction methodologies or the rate of oil and gas production," the researchers write. 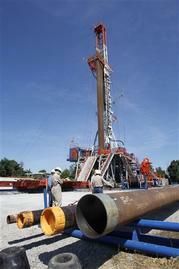 Lead author William Ellsworth said he's confident fracking isn't responsible for the trends found in this study. They are to present their paper next month at the annual meeting of the Seismological Society of America in San Diego. "The man in charge of ensuring the safety of miners at West Virginia's Upper Big Branch coal mine pleaded guilty Thursday to charges that he helped conceal hazardous conditions from federal inspectors," Jackie Castillo reports for CNN. "Gary May is the highest-ranking executive of former mine owner Massey Energy charged in connection with an April 2010 explosion that killed 29 miners." May could get up to five years in prison and be fined $250,000 for conspiring to defraud the federal government, but he has agreed to cooperate with the investigation into the worst U.S. mining accident in decades." His sentencing is set for Aug. 9. The nationally noted incident between two basketball fans, one of the University of Kentucky and the other represented as a fan of the University of Louisville, "may actually have stemmed from ongoing hostility" between the two, Dan Adkins reports in today's edition of the thrice-weekly News-Graphic in Georgetown. And the supposed U of L fan says he's a UK fan. Charles Taylor, 71, punched Ed Wilson, 68, after Wilson gave him the finger and told him to stop "running his mouth" and saying Louisville would beat Kentucky in the national semifinals of the NCAA men's basketball tournament Saturday. "There is some dispute about the blow that was thrown," Adkins reports. "A police report says Wilson 'reports that Mr. Taylor came over to his chair and stood over him ... (and) struck him on the left side of his face.' The report also said Taylor 'stated that he struck Mr. Wilson in the head.' . . . Taylor told the News-Graphic that he 'hit (Wilson) in the chest.' In any event, Wilson did not appear to have been injured, the report said. No charges have been filed." Wilson declined to discuss the incident in detail. "Taylor said he’s come out on the worst end of the incident – and not because he has been inaccurately labeled a U of L fan," Adkins writes. "Officials at the dialysis center told him he has been suspended from receiving the life-saving treatments there, Taylor said. He must now travel to Lexington for treatments. 'They’re saying it’s going to cost me $18 for a ride to Lexington,' Taylor said." All but the first two paragraphs of the News-Graphic story are behind a pay wall, so it will cost you $6 to read it. Companies have been scouting locations for new horse slaughterhouses and processing plants since the horse abattoir inspection ban was reversed, but ban supporters are "trying hard to keep them out," Agri-Pulse reports. 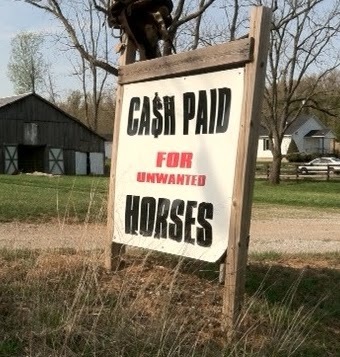 United Equine LLC was considering a location in Missouri, but abandoned its plans after local protests. The situation is repeating itself in other places, too, despite company assurance that horses are treated humanely before slaughter. Hermiston, Oregon, is a potential site for a horse processing plant and rejuvenation project, organized by United Horsemen. "In addition to slaughter, the plant would include an onsite 'Rest and Rejuvenation Program,'" in which horses would be evaluated and then go into either training, rejuvenation or processing, Agri-Pulse reports. A United Horsemen representative said slaughter would be humane, and equipment and management has been approved by Dr. Temple Grandin to "ensure a minimum of stress and pain" for horses. 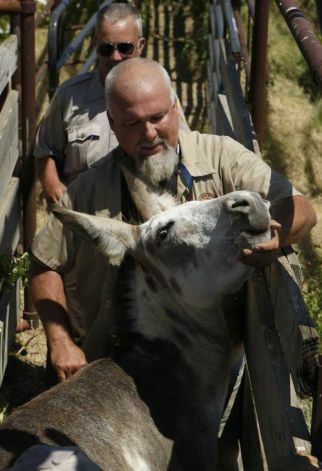 Equine Advocates Rescue & Sanctuary will host the 2012 American Equine Summit this weekend, with its stated objective "to reverse the damage done by Congress in November 2011 by mobilizing an effective grassroots movement to end the slaughter of America's horses in the U.S. and abroad." President Susan Wagner told Agri-Pulse Congress had ignored the will of more than 80 percent of Americans who oppose horse slaughter. But former Texas congressman Charles Stenholm said U.S. horse slaughter is best for equestrian welfare: "Horses are undoubtedly special, but they're livestock. The idea that you can take away the salvage value of horses is having a devastating impact on the industry right now." Unemployment in the Great Plains is consistently lower than the national average, but on the coasts and in the Southeast, it's consistently higher than the national average. Bishop writes that counties from the Dakotas and Nebraska dominate the 50 counties with the lowest unemployment rates, and have for the last several years. 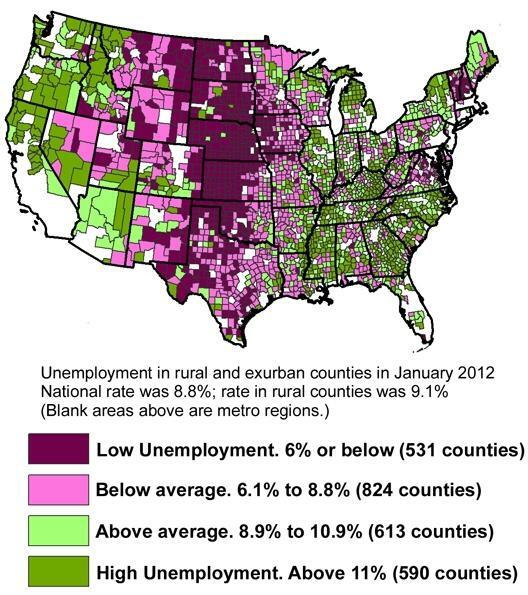 New Hampshire, Vermont and parts of rural Virginia also have low unemployment rates, but "the unemployment map of rural America looks like a barber pole, with stripes of high unemployment along the coasts and into the Midwest and low unemployment running down the center of the country," writes Bishop. Of the top 10 counties with the highest rates, three each are in Alaska and North Carolina, two are in California and New Mexico and Michigan have one each. 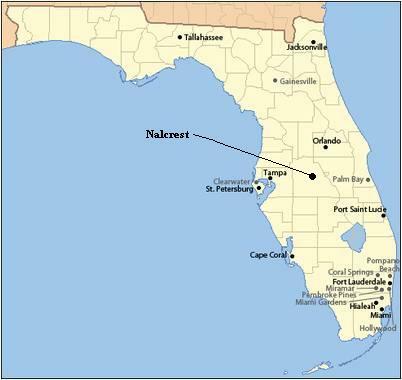 Nalcrest, Fla., is where many former U.S. Postal Service mail carriers go to retire. 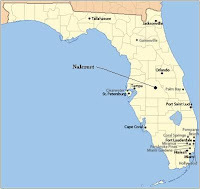 The small community about 70 miles east of Tampa is the only one in the U.S. that caters specifically to retired postal workers. The 700 residents are now trying to help the struggling USPS by exclusively using it for all mailing and shipping needs, from paying bills to sending packages to grandchildren. "We say ... it's got to come through the U.S. mail or we don't want it here," 67-year-old Matty Rose told Jennifer Levitz of The Wall Street Journal. The attachment to mail runs deep in Nalcrest, which residents joke stands for "National Association of Letter Carriers at Rest," Levitz reports. It has its own zip code and post office, a mailman statue in the village square and a stamp club. It's also a "no-dog" community: "Carriers who spent years pounding the pavement relax under palm trees in a kind of mail carrier bliss: no ice to tumble on, no snow to slosh through, and best of all, no furry foes," Levitz writes. Pesticides are wrongfully getting all the blame for colony collapse disorder, University of California-Davis Extension bee expert Eric Mussen said at the annual Society and Toxicology ToxExpo in that state. Recent studies have found insecticides contribute to the disorder, leading several groups to ask the Environmental Protection Agency to ban use of some pesticides. But Mussen said several factors contribute to CCD, not just one class of insecticides, Kathy Garney of Western Farm Press reports. Rural America now has another prescription drug to worry about: Opana, an opioid painkiller containing oxymorphone, typically prescribed for chronic back, osteoarthritis or cancer pain. It's become the drug of choice in Scott County, Indiana, where most of the nine overdose deaths this year involved Opana, reports Mary Wisniewski of Reuters. About half the deaths referred to the coroner in the county near Louisville, Ky., last year were Opana overdoses. 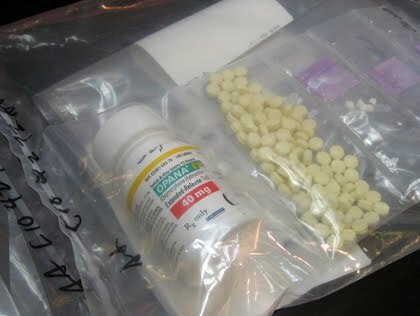 Police in the area say the rise of Opana abuse started when Oxycontin was reformulated to be harder to snort or inject in 2010. Abuse of Opana can be deadly because it's more potent per milligram than Oxycontin. Wisniewski reports the drug's street names are "stop signs, the O bomb, and new blues," and it's typically crushed and snorted or injected to defeat its "extended release" design. Opana manufacturer Endo Pharmaceuticals is reformulating Opana to make it harder to crush and turn "gooey" when water is added, which makes it hard to abuse. But the old form is still available. Police in Southern Indiana say they are "consumed" by Opana-related crime. In the northern part of the state, there have been 11 pharmacy robberies in Fort Wayne since Endo announced the reformulation. 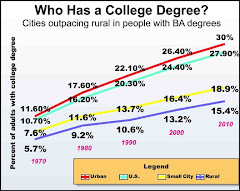 The percentage of rural people 25 years old or above with college degrees has increased almost three-fold since 1970, but the gap between cities and rural places has grown, reports Roberto Gallardo and Bill Bishop of the Daily Yonder. In 2010, there was a 15 percentage-point gap, compared to a 6 percentage-point difference in 1970. 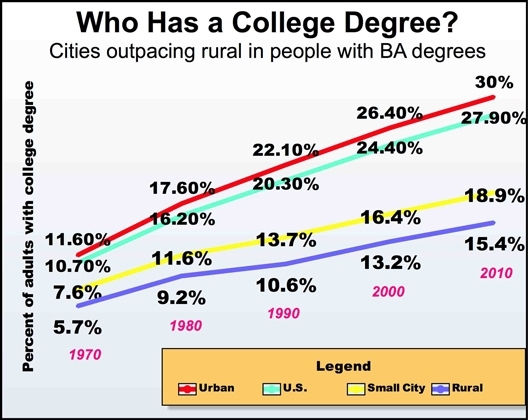 Still, in percentage terms, the urban-rural ratio of college graduates has improved slightly, dropping below 2 to 1, and Bishop and Gallardo note that rural America "has caught up in every other measure of education." In 2010, 27.4 percent of rural adults had some education after high school, but less than a four-year degree. That was less than 1 percentage point below the national average. In 1970, only 7.8 percent had some college. In the last 40 years, the percentage of rural adults with less than a high-school education has dropped to 18.9 percent from 60 percent. Bishop and Gallardo say the numbers probably reflect the trend toward college-educated rural youth moving to cities to pursue careers, and not coming back home. "The loss of young, well-educated residents is a long-standing problem for rural communities," they write. In a move that could end construction of new coal-fired power plants, the Environmental Protection Agency will issue its first proposal for limits on greenhouse-gas emissions from new power plants as early as today, reports Juliet Eilperin of The Washington Post. The proposed rule will require new plants to emit less than 1,000 pounds of carbon dioxide per megawatt of electricity produced. The average coal plant emits 1,768 pounds of CO2 per megawatt, but the average natural-gas power plant emits 800 to 850 pounds per megawatt. The rule provides an exemption for coal plants already permitted and beginning construction within a year. 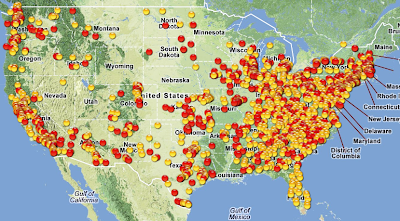 There are about 20 coal plants currently pursuing permits, two of which are federally subsidized;one is expected to meet the new standard, Eilperin reports. The proposed rule does not cover existing plants, but utility companies have said they will close more than 300 boilers, which produce nearly 13 percent of coal-fired electricity, instead of making expensive pollution-control upgrades. The low cost of natural gas is contributing to the closure of old coal-fired plants because many utilities are switching to gas plants. Coal advocates say the rule will "drive affordable coal out of the electricity market," but environmentalists say it "captures the end of an era during which coal provided most of the nation's electricity," Eilperin writes. The public will be allowed to comment on the proposed rule for a month before it's finalized, but its supporters are confident it will be made law before the end of President Obama's current term. 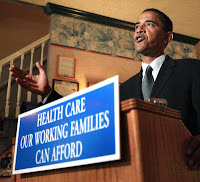 (Read more) For a later report from Neela Banerjee of the Los Angeles Times, go here. As Congress debates a bill to help the financially strapped U.S. Postal Service this week, West Virginia Sen. Jay Rockefeller plans to introduce legislation that would raise mailing costs for newspapers and other periodicals, Paul Nyden of The Charleston Gazette reports. The amendment calls for a 5 percent annual increase on periodical mailing costs until the USPS decides the rate is high enough. 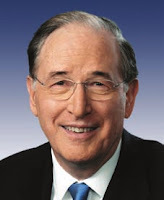 The current proposed bill does not include any postal cost increases for newspapers or other periodicals. Tennessee Gov. Bill Haslam is set to sign a controversial bill that would allow open discussion in elementary and high school classrooms of alternative theories to evolution and climate change and "declares that teachers cannot be disciplined for permitting such discussions," reports Tom Humphrey of the Knoxville News-Sentinel. If Haslam signs the bill, Tennessee will become the fourth state to have such laws on the books. Haslam, a former mayor of Knoxville, said he knew little about the bill and was going to ask state Board of Education officials about the details. The bill was originally passed out of the state's House last year, but amended in the Senate and sent back to the House. Brian Merchant of TreeHugger, an environmental blog, said the climate-change aspects of the bill were written by the conservative American Legislative Exchange Council, which holds meetings for state legislators and lobbyists and is supported by fossil-fuel energy companies. The Center for Media and Democracy found more than 800 bills and resolutions in several states written by ALEC. Businesses that cater to rural areas are among those that have spent $300 million in the past three years lobbying Congress to support or oppose various proposals concerning the U.S. Postal Service, in ways generally friendly to USPS as well as their own interests. Congress begins work on legislation this week to help the struggling, debt-riddled agency. "The service is the backbone of a mailing and shipping industry that employs more than 8.5 million people and supports almost $1 trillion in economic activity every year," Ron Nixon of The New York Times reports. "The service itself employs 574,000 people." Doctors in Pennsylvania will be able to request information about hydraulic fracturing chemicals, but won't be able to share that information with patients because of a little-known provision in a new law about natural-gas drilling in the state, Kate Sheppard of Mother Jones reports. The state has been the epicenter of gas drilling in the Marcellus Shale formation, and recent studies have suggested linkage between fracking and health conditions. The law says doctors or other health professionals must sign a confidentiality agreement stating they won't disclose the fracking chemicals to anyone else if they request it. The provision wasn't in the original version of the law debated by the state Senate or House; it was added during conference committee meetings, meaning most lawmakers didn't notice it. The industry has long been able to keep chemical information secret from the public by labeling it "proprietary information," but most of the chemicals used are publicly known. Louisiana's presidential primary on Saturday continued the religious pattern in the Republican race: "In states where evangelicals make up more than 50 percent of the Republican electorate, Romney can’t win; in states where they make up less than 50 percent, he can’t lose," Steve Kornacki writes for Salon. 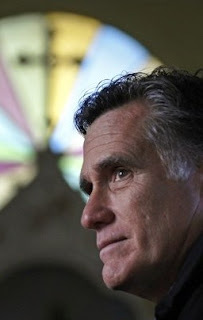 While most of GOP evangelicals' resistance to Romney is "tied directly to religion," Kornacki says, it may have less to do with his Mormon faith than "his culturally liberal past." He cites the research of Michael Tesler, an assistant professor of political science at Brown University, who argues that the resistance has little if anything to do with being anti-Mormon, and mainly with the degree of evangelicals' conservatism on "moral issues" such as abortion and gay marriage. Before the primaries in Louisiana, Mississippi and Alabama, Tesler looked at seven polls conducted by YouGov, and found that "Evangelical Republicans do not feel that much colder towards Mormons than their fellow partisans," but "are much more conservative on these issues than their fellow partisans," and are "more likely to vote in the primaries based upon moral issues than other Republicans." For Tesler's full analysis, with graphs, click here. Companies have installed hundreds of gathering pipelines during the natural gas boom, and auditors found that in some states, officials don't know where the pipelines are located. If there are fewer than 10 homes within 220 yards of a gathering line, they aren't inspected, and Burke reports that most residents in rural areas don't know the pipelines are not regulated by the federal government. There are about 200,000 miles of gathering lines in the U.S., but only about 24,000 miles are federally regulated, Burke reports. After Kentucky Derby horse Eight Belles was euthanized on national television in 2008, Congress banned anabolic steroids in horses, but through analysis of more than 150,000 races, injury reports, drug-test results and interviews, the Times found that the industry is "still mired in a culture of drugs and lax regulation and a fatal breakdown rate that remains far worse than in most of the world." 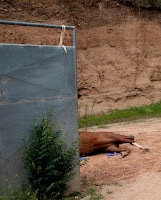 About 3,600 horses died racing or training at state-regulated tracks over the last three years. A Times interactive map highlights death rates in each state. Trainers have more incentive to race unfit horses because of increased casino gambling, which raises purse sizes. Since 2009, trainers have been caught illegally drugging horses 3,800 times, the Times reports. During the same period, 6,600 horses broke down or were injured. The highest number of incidents in a single day happened on the day of the Kentucky Derby last year. Two horses fractured legs, and seven jockeys at other tracks were thrown after their horses broke down. For the Times story and a nice graphic showing the history of the term, and examples of its use, by Amanda Cox, Alicia DeSantis, Alicia Parlapiano and Jeremy White, click here. Publishing teachers' evaluations in newspapers is not a good use of performance data, U.S. Education Secretary Arne Duncan, right, said last week. Stephen Sawchuk of Education Week reports Duncan said printing the ratings is "a tremendous downside for teachers," especially at a time when morale is very low: "We need to be sort of strengthening teachers, and elevating and supporting them." His comments follow those of others, including Bill Gates and Teach For America's Wendy Kopp, who say publishing the data "amounts to public shaming of teachers." 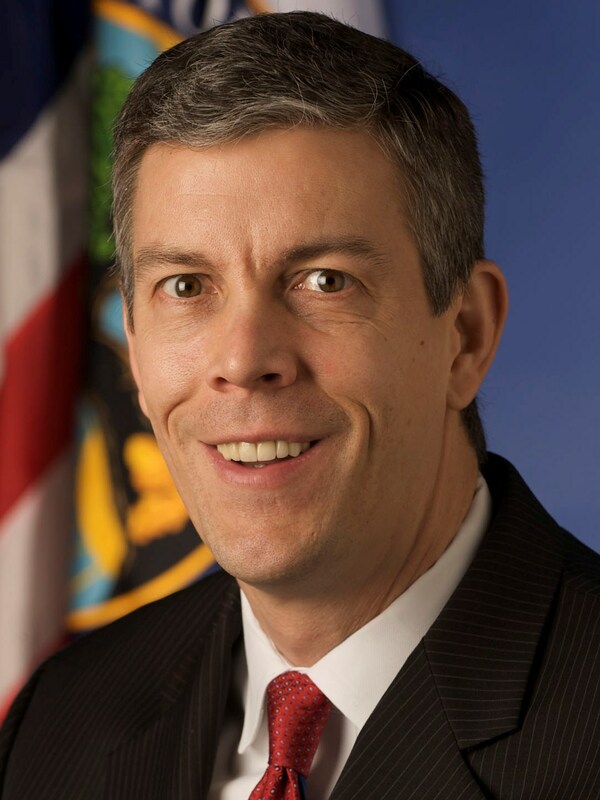 Duncan said he supports "judicious disclosure of this data to school principals and to parents," and said any such data should take a comprehensive look at teacher performance, not merely be based on student test scores. In 2010, the Obama administration's health-reform law boosted funding for the National Health Service Corps by more than $530 million. By 2015, funding for the program will reach more than $1 billion. The program forgives doctors' student loans in exchange for a stint in a medically under-served area, most of which are rural. Conner Howell of the Denton Record-Chronicle in Texas wrote recently about the program and a local doctor who benefited from it, a story that could be told in many places. Howell reports that the total number of doctors in the program is now up to more than 10,000 from 3,600 in 2008. Texas ranks 47th in the number of primary care doctors per 100,000 people, according to the Association of American Medical Colleges' 2011 physician workforce report. Howell reports fewer than 18,000 primary-care doctors serve the state's 25 million people, 3.5 million of which live in rural areas. Three years ago, the Atlanta Journal-Constitution exposed cheating on test scores in the city's schools. Today the paper reported, "Suspicious test scores in roughly 200 school districts resemble those that entangled Atlanta in the biggest cheating scandal in American history. . . . Big-to-medium-sized cities and rural districts harbored the highest concentrations of suspect tests." The newspaper's analysis identified unusual changes in student cohorts, those groups of students that move together from grade to grade. "While the analysis doesn't prove cheating, it found troubling patterns" in hundreds of school districts," the newspaper reports. "A typical (non-cheating) district might expect to have about 5 percent of its classes flagged for unusually high or low performance relative to their performances in the previous year. Districts which consistently have 10 percent or more of their classes flagged or which have an extremely high flag rate in a particular year certainly deserve further examination." The map below shows in yellow the districts in the former category; the districts in the latter category are in red. Nebraska and Louisiana are not included in the data due to special circumstances. The paper has an online, searchable database here. The story was reported by Heather Vogell, John Perry, Alan Judd and M.B. Pell. They will be on a live, online chat at 11 a.m. EDT Tuesday.